The Indianapolis Colts and Oakland Raiders are two teams in the AFC conference that have gone in completely different directions this season. As usual, the Colts came into this NFL regular-season as legitimate Super Bowl title contenders and the favorites to be the team to win it all at season’s end, but things haven’t turned out the way they anticipated as they have been ravaged by injuries and might be on the verge of missing the playoffs altogether. The Oakland Raiders on the other hand have gone from arguably one of the worst teams in the NFL to possibly making the playoffs for the first time in quite some time. 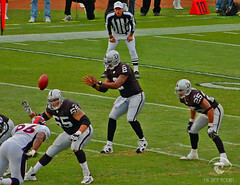 Not only has the Raiders defense come back life as they have one of the best passing defenses in the league holding opponents to just 197.3 passing yards per game (5th in the NFL), but their offense is also come to life this season as they have second best rushing attack in the league (157.5 rushing yards per game) with up-and-coming running back Darren McFadden leading the way for the Silver and Black. Ironically enough though, the Oakland Raiders still might be on the outside looking in on the playoffs this season as they have a record of 7-7 coming into Week 16’s matchup with the Indianapolis Colts. The Raiders playoff hopes aren’t over just yet as if they win their last two games against the Indianapolis Colts and the division rival Kansas City Chiefs they will still a chance to win the AFC West division title. If they do not make the playoffs this season and beat the Chiefs in the last week of the NFL regular season, the Oakland Raiders will make history once again this season as they will be the first team in NFL history to go on this heated in division play and not make it into the playoffs. That historical milestone seems fitting for the Oakland Raiders as they have disappointed their fans for almost a decade now and always seemed to drop the ball at the right time. Despite normally being heavily favored to lose a game against the Indianapolis Colts, Peyton Manning and company are only favored to win this matchup with a -3 point spread. That will be pretty surprising to most people, but the fact is the Oakland Raiders past defense is amongst the best in the league and should give the Indianapolis Colts a run for their money as Peyton Manning might struggle to get his offense going. Along with the Raiders past defense giving the Colts offense some problems, Oakland’s running game will really give the Indianapolis defense trouble as Darren McFadden might be in for very big day on the ground and ultimately lead his team to victory.